LetsRun.com note: We never put up this release on the Indoor Marathon in NYC at the Armory (Wejo’s new local track) next month. On the women’s side there is still opportunity for a woman to run and pick up some “easy” money. There is only one women in the elite field. The winner gets $3,000, 2nd place gets $2,000 and 3rd place gets $1,000. And any woman who breaks the existing WR (2:40:55) gets an extra $1,000. If you win the race and break the WR you get an extra $4,000. 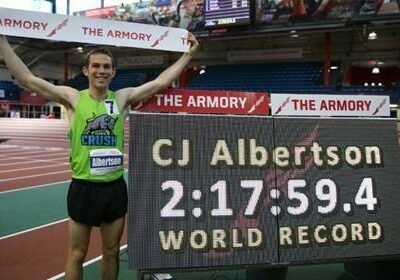 NEW YORK, March 4, 2019 – The men’s indoor marathon world record holder is returning to defend his title in the Columbia & NewYork-Presbyterian Indoor Marathon Presented by New York Road Runners on Saturday, April 13 at The Armory in Washington Heights. The women’s side will have one of the country’s top long-distance performers/coaches competing in the 211-lap indoor marathon at The Armory’s New Balance Track & Field Center. Both the indoor marathon world record for men and women have been set during the previous three editions of this unique event, and this year’s field of challengers is beginning to take shape. Headlining the men’s field is defending champion and world record holder Malcolm Richards. Richards first appeared at the inaugural indoor marathon in 2016, winning in a time of 2:21:55. 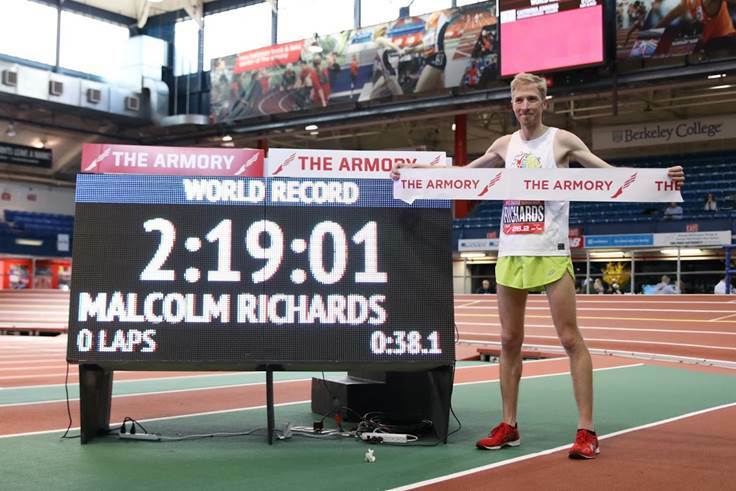 After losing the record the following year, Richards returned in 2018, running a new record of 2:19:01, making him the first runner to break 2:20 indoors. In addition to his athletic pursuits, Richards works as a schoolteacher at home in San Francisco, and he has expressed vocal support for the Armory College Prep program, which benefits greatly from theindoor marathon. Challenging Richards will be Chris Zablocki, who ran 2:21:47 in 2017 to set what was the world record at the time. A doctor from Connecticut, Zablocki was once profiled by the New York Times as “the world’s best extreme marathoner.” He regularly runs a double-digit number of marathons per year, and once medaled in marathons on three consecutive weekends, an almost unheard of feat. With an outdoor personal best of 2:13:45, Zablocki is certainly capable of retaking the record from Richards. Andrew Lemoncello and Jonathan Kotter are also scheduled to compete. Lemoncello twice competed for Great Britain at the World Championships in the 3,000m steeplechase and in the same event in the 2008 Beijing Summer Olympics, before transitioning to the marathon later in his career. Kotter is a former standout at Brigham Young University and has found post-collegiate success on the roads at a variety of distances. On the women’s side, the lone athlete confirmed at this juncture is Stephanie Pezzullo. Pezzullo is an accomplished athlete at distances ranging from 800m to the marathon, with an outdoor best of 2:32:42. In addition to her running, Pezzullo also coaches approximately 25 runners and triathletes in the central Florida area. Pezzullo was recently profiled by Runner’s World for adopting a stray dog – she named Santos – that she encountered on a run. The athlete-canine duo are now inseparable training partners. Upon hearing the meet hotel, The Roxy, is dog friendly, Pezzullo hopes to have Santos trackside supporting her through 211 laps. Pezzullo will have her eyes on the indoor record of 2:40:55, set one year ago by Lindsey Scherf. Entry spots in the race are still available for both men and women. The winner of each race will receive $3,000 in prize money, with another $4,000 available as a bonus for a new world record. The Armory’s 200-meter banked oval is the perfect venue to chase a fast time, with ideal pacing made possible by the repetitive nature of the lapped race. The facility has seen hundreds of records at shorter distances during its storied history and the indoor marathon is now a part of The Armory’s tradition. The team relay portion of the event, to take place April 12-14, allows groups of up to eight friends, family members or co-workers to tackle the distance as a group, making this race accessible to all. Proceeds from the event benefit the non-profit Armory Foundation and Armory College Prep, which sends nearly 100 percent of its New York City high school students to four-year colleges and universities. Runners interested in signing up for the team relay or requesting further information should go to www.indoormarathon.org. The Armory is a New York City non-profit institution, with the mission of “Keeping Kids on Track.” Each season The Armory— the proud home of the NYRR Millrose Games — hosts more than 100 track & field meets and welcomes more than 220,000 athlete visits. 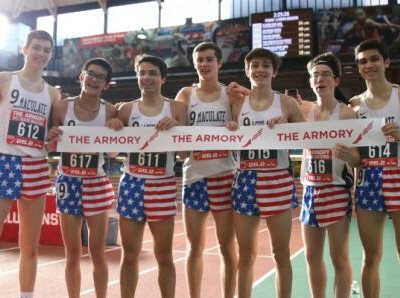 Among its many youth sports and educational programs, including the acclaimed Armory College Prep program, The Armory runs the leading collegiate indoor track meet with the Dr. Sander Invitational, and hosts the largest high school indoor track meets with this year’s 25th Hispanic Games, The New Balance Games, and the New Balance Nationals Indoors. The Armory also runs NewYork – Presbyterian ColumbiaDoctors Indoor Marathon presented by New York Road Runners, which is the world’s largest indoor marathon relay. The Armory is also the home to the National Track & Field Hall of Fame and dozens of very large education-focused events. For more: Please visit Armory.NYC and ArmoryTrack.com. NYRR’s mission is to help and inspire people through running. Since 1958, New York Road Runners has grown from a local running club to the world’s premier community running organization. NYRR’s commitment to New York City’s five boroughs features races, community events, free youth running initiatives and school programs, the NYRR RUNCENTER featuring the New Balance Run Hub, and training resources that provide hundreds of thousands of people each year, from children to seniors, with the motivation, know-how, and opportunity to Run for Life. NYRR’s premier event, and the largestmarathon in the world, is the TCS New York City Marathon. Held annually on the first Sunday in November, the race features 50,000 runners, from the world’s top professional athletes to a vast range of competitive, recreational, and charity runners. To learn more, visit www.nyrr.org.